The Carolina Rig Another great technique is Carolina rigging. The main difference between a T-rig and a C-rig is the space between the hook and the sinker. A swivel stops the bullet shaped sinker from running down all the way to the offset hook. This makes your bait suspend or free float and gives it a more natural and non-spook appearance. Carolina rigging is mainly a search method; dragging and feeling the bottom structure by maintaining a steady retrieve. The bait will kick and swim as the sinker hits rock, gravel and other structure. It is also a great method for lethargic fish as the bait presentation is subtler and the sinker is not as visible for the fish. 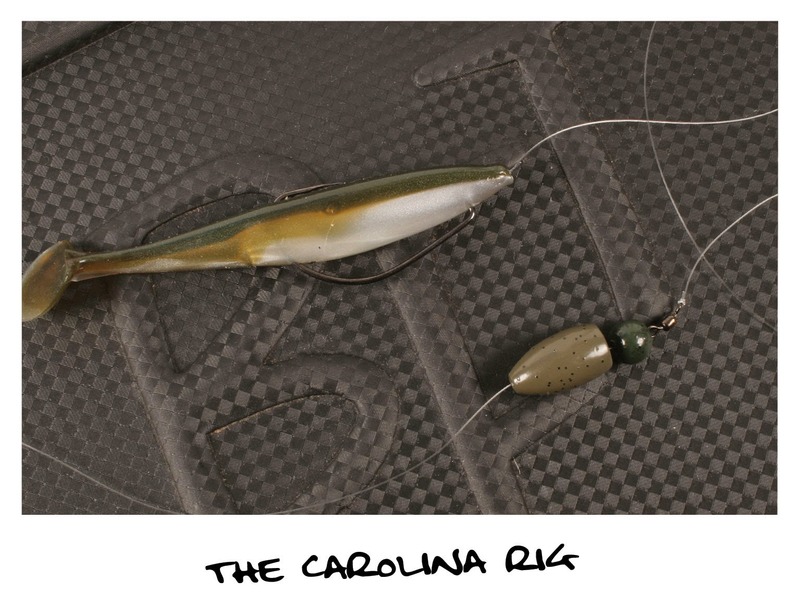 Compared to the Texas rig, the C-rig works better on flat and medium-structured bottom, gravel bars and humps. Leader lengths can vary and there are some points that should be taken into consideration. A typical leader is 30 to 50 cm long. Clear water and tricky fish often means longer leaders. In situations where the lakebed is covered with grass or weed a leader as long as 150 cm can be very effective. The bait will suspend over the weeds without ever getting snagged. A glass bead or force bead between the sinker and swivel can also be used when Carolina rigging. The clicking sound often attracts fish from far away. Same softbaits used on a T-rig can be used on a C-rig.